Some preparedness thoughts and such. How we prepare and plan to prepare. We recently made a trip to Yellowstone National Park as a family and to make it more enjoyable for the kids, we purchased some binoculars before we went. As I researched my options, I realized that binoculars just might have a place in your emergency plan. Okay, maybe that's a stretch given the many things that would come before like water, food, clothing, shelter, heat, etc., but they might be a little useful. In determining which binoculars to buy, I first wondered what numbers like 10x28 or 8x22 mean. This excellent site explains that the first number is magnification and indicates how many times closer the subject looks. The second number is the diameter (in millimeters) of the objective lenses. Divide the first number into the second and you get an idea of how much light comes through the lenses which has a direct correlation on the clarity and brightness of the subject. The site also explains the prism types (roof vs. porro), the different types of coatings, and other important factors. 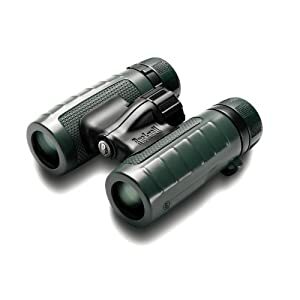 After reviewing my options, I settled on the Bushnell Trophy XLT 10x28 compact binoculars which retailed around $80. I chose them based on price, features (magnification, coatings and waterproof), and size. For the kids, I bought Tasco 8x21 compact binoculars for $10 each. While the binoculars were helpful in viewing some of the wildlife, we didn't need them to see all the wildlife. Two bison crossed the road right in front of our vehicle before stomping down the oncoming traffic lane right next to our vehicle. Here's a couple pictures.